EMPORIO ARMANI AR5905. MODEL : AR5905. Anything else for instance glass breakage, broken strap etc is not covered. CASE COLOR : BLACK/ROSE GOLD. STRAP COLOR : SILVER. DIAL COLOR : BLACK. CASE WIDTH : 43MM. WATCH SPECIFICATION ---Brand: Armani ---Model Number: AR5905 ---Case Width: 42 mm ---Case Depth: 10 mm ---Display Type: Chronograph Case ---Material: Stainless ---Steel Movement: Quartz Strap ---Type: Stainless Steel ---Strap Width: 20 mm ---Max Strap Size: 220 mm ---Min Strap Size: 130 mm ---Clasp Type: Hidden ---Water Resistance: 50 m ---Features: Silicone Wrapped Stainless Steel Strap ---Packaging: Official Emporio Armani Presentation Box PRODUCT INFORMATION The Emporio Armani Black and Rose Gold Mens Chronograph Watch AR5905 certainly stands out with its stunning black and Rose gold finish. This Armani watch features a desirable gold stainless steel strap which has been covered in black rubber, giving a sporty yet sophisticated look to the watch. The Armani AR5905 watch has a black dial, chronograph function and date display window. Model number: HB1513361. Series: SUPER NOVA. Material: Stainless Steel. OTHER FUNCTIONS. Dial Color: Grey & Red Tone Dial. Case Thicknes: 14mm. Band material: Stainless Steel. -1 x Wrist Watch (opp bag). Band colour: BLACK Steel. Dial colour : Black. Display type: Pointer. Shape of the dial: Round. Mens Emporio Armani AR5905 Black & Rose Gold Chronograph Watch. Condition is Used. Dispatched with Royal Mail 1st Class. 42mm case diameter. Includes 3 spare links. Butterfly clasp. Great condition. Chronograph and date function. Luminous hands. Plated stainless steel and silicone wrapped links. Found this watch with others in a jewellery box while clearing a relative’s house. I don’t know anything about it other than the make which is on the watch. Brand new Emporio Armani AR1893 Men’s Watch Sized for a 6” wrist but has spare links Comes with box, authenticity tag etc Selling as it’s not my style Posted same or next day! Scuderia Ferrari 0830182 Mens Gran Premio Black Leather Strap Watch. Strap Type: Leather strap. Strap colour: Black. Dial Colour: Black. Case depth approx. : 12mm. Case Material: Stainless Steel. Case Shape: Circle. Stylish and practical this CITIZEN Eco-Drive Chronograph is a perfect addition to your watch wardrobe. The watch is 100m water resistant. Features: 12-Hour Dial, Chronograph, Date Indicator. A simple, yet revolutionary concept: a watch that never needs a battery. The wrist strap is 25.5cm in length. LADIES WATCHES. POCKET WATCH. Dial Colour: White. Strap Colour: Two tone. Gender: Ladies. Head Shape: Round. Head Casing: Stainless Steel. Watches2U have now been in operation for over 15 years and have a wide range of different great value products. Mens Emporio Armani White Chronograph Watch. New and sealed, no box or accessories. Happy bidding. Instruction Manual & Warranty Booklet. Dial Colour: Grey. Watch Details. Genuine Burberry Ladies Watch Heritage Dial Two Tone Silver&Gold . Used exelent condition, like new, in working order, sold without orginal box, big size bracelet, any qestions please ask, read the shipping information carefully I do not send parcel oudside the UK Dispatched with Royal Mail 2nd Class. 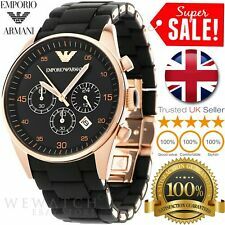 Mens Emporio Armani AR5905 Black & Rose Gold Chronograph Watch. Condition is Used. Dispatched with Royal Mail Signed For® 2nd Class. This Bluetooth enabled watch is compatible with all android devices (2.3 or above). All you need to do is connect the watch to your phone via Bluetooth. For ANDROID it will support all functions. (Picture for illustration only). 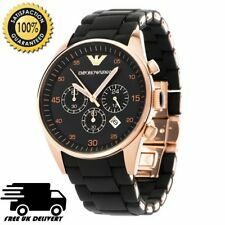 Mens Emporio Armani AR5905 Black & Rose Gold Chronograph Watch. Condition is Used. Dispatched with Royal Mail 1st Class. If you zoom the pictures there is a little chip on the glass, however it's hardly visible. Watch it's in a good used condition I had it for over 2 years. Thanks for watching and happy bidding. The AR1893 looks the works, impressive all watchers. Gold-tone stainless steel case and bracelet. Fixed gold-tone bezel. Minute markers around the outer rim. The Emporio Armani logo appears at the 12 o'clock position. LADIES WATCHES. POCKET WATCH. Dial Colour: White. Strap Colour: Rose Gold. Plating: Rose Gold. Gender: Ladies. Watches2U have now been in operation for over 15 years and have a wide range of different great value products. Stainless steel case with a stainless steel bracelet wrapped in black silicone. Fixed rose gold-tone bezel. Minute markers arond the inner bezel. The Emporio Eagle appears at the 12 o'clock position. 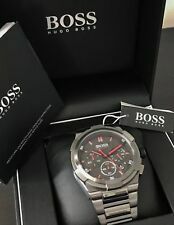 Hugo Boss Ladies Silver Symphony Bracelet Watch . Condition is Used. Dispatched with Royal Mail 1st Class. 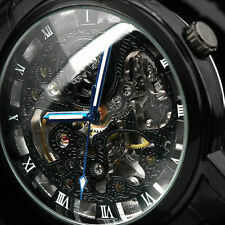 Marc Ecko Gents The Havoc Skull Black Dial with Stainless Steel Bracelet . Condition is Used. Dispatched with Royal Mail 1st Class. Scuderia Ferrari Mens Red Rev Watch 0830249. Official Scuderia Ferrari Red Rev Watch. Fitted with a black Silicon strap, stainless steel buckle, and embossed ferrari emblem catch. Black resin case with black dial with Ferrari logo and white detail. 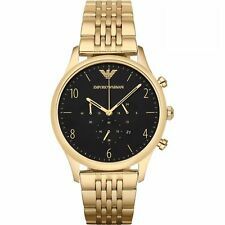 NEW EMPORIO ARMANI AR2434 BLACK DIAL STAINLESS STEEL MEN'S WATCH SALE!!! Classic yet contemporary, these stainless steel band automatic quartz movement wristwatches are a must-have for any wardrobe. Stainless steel bands are resistant to corrosion, giving them added durability. The bands have a modern style, which gives them a beautiful, sleek feel. These watches also have low-maintenance designs, making them ideal for anyone with a busy lifestyle. The movements are renowned for their accuracy, making these watches especially reliable. With their modern styles, stainless steel case watches are great for updating your outfit. Constructed with scratch-resistant designs, they are less likely to get damaged by any accidental drops. 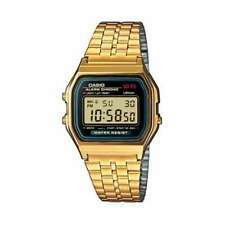 Solid gold case wristwatches are designed with precious materials, giving these watches added value. With traditional styles, they are versatile accessories that you can wear whether you're enjoying a day at home or a night on the town. Whether you prefer a watch with Roman numerals or Arabic numbers, analogue wristwatches are available with a wide variety of dial features. Designed with stylish and functional displays, these analogue watches are the ideal additions to your wardrobe. LED wristwatches display the time digitally, so they are very easy to read. Generally designed with a quartz crystal and a tiny digital computer in order to keep track of the time, they deliver enhanced accuracy. 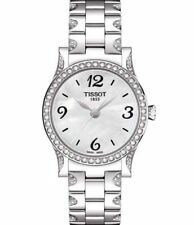 Timeless yet chic, white face watches will add instant style to any outfit. They have popular designs to perfectly pair well with any outfit. Red face wristwatches will add a hint of colour to any outfit. With a unique face colour, these watches with red bands are perfect choice for expressing your personal taste. 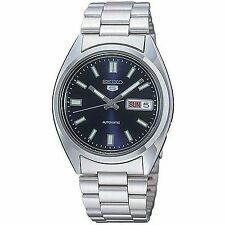 What are some sought after stainless steel band Automatic quartz movement watches to consider on ebay?